Phirni is a creamy rice based Indian pudding often flavoured with cardamom, saffron or rose water. 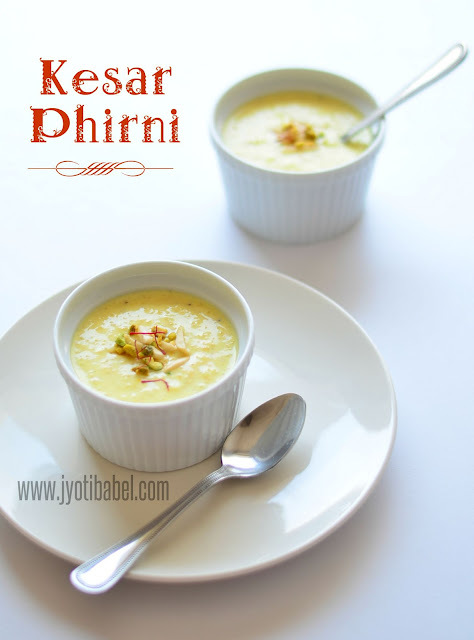 The Kesar Phirni recipe I am sharing today has been flavoured with saffron and cardamom. It has almost the same ingredients as a rice kheer, but there is some difference in the preparation process. Whole grains of rice is used in making kheer but, for phirni, we need coarsely ground rice. Kheer can be served hot or cold, but phirni tastes best when served chilled. I was introduced to this delicious sweet dish by a good friend when I was living in Dublin. For one of our get-togethers, my friend had prepared phirni and had flavoured it with rose water. I still remember how delicious it tasted. But, somehow I had never tried making phirni on my own. When I was looking for recipe ideas to work on this BM, I thought to try phirni. I even called her to learn how exactly she makes it. Although I wanted to make rose flavoured phirni, I dropped the idea as I didn't have rose water. So, I made this Kesar phirni instead. Phirni almost has a custard-like consistency. Traditionally, it is served in earthenware (Sikora). Since I couldn't find them, I used my white ramekins to serve them. With a garnishing of almond slivers, chopped pistachios and strands of saffron, it looked like a perfect dessert to complete a meal. It is a great sweet dish to prepare for any festive occasion. 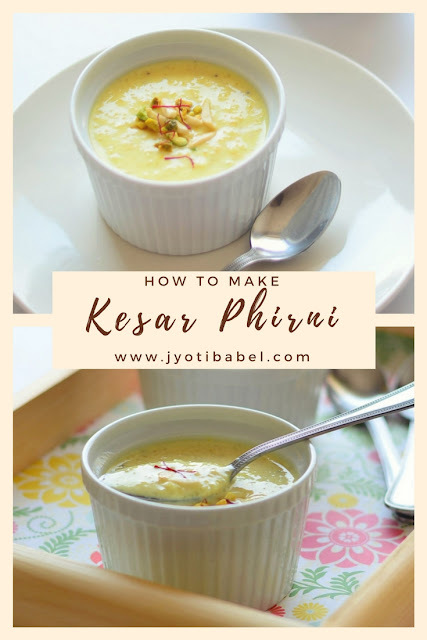 Let's now how I made this Kesar Phirni. 1. Wash and rinse the rice in water. Soak it in fresh water for half an hour. Drain off the water completely and spread the rice on a muslin cloth to pat them dry. Coarsely grind the rice in a blender jar. The ground rice will resemble regular semolina granules. 2. Meanwhile, in a non-stick pan add milk. Bring it to a boil and then turn the heat to medium or low. Keep boiling and stirring, till the milk is reduced to half. It will take about 15to 20 minutes. 3. Now add the cardamon and the coarsely ground rice. Stir and cook for another 10 minutes. The ground rice will get cooked and the milk will get creamier. Add the saffron paste and stir. Add sugar now and cook for another 5 minutes. 4. Take it off the gas and transfer it into another container. It will thicken further on cooling. In case it gets too thick, you can add some more milk. Let it cool completely and then keep in the fridge to chill. 5. Serve them chilled in individual bowls with a garnishing of almonds, pistachios and saffron. Other Indian sweet dishes you might like. 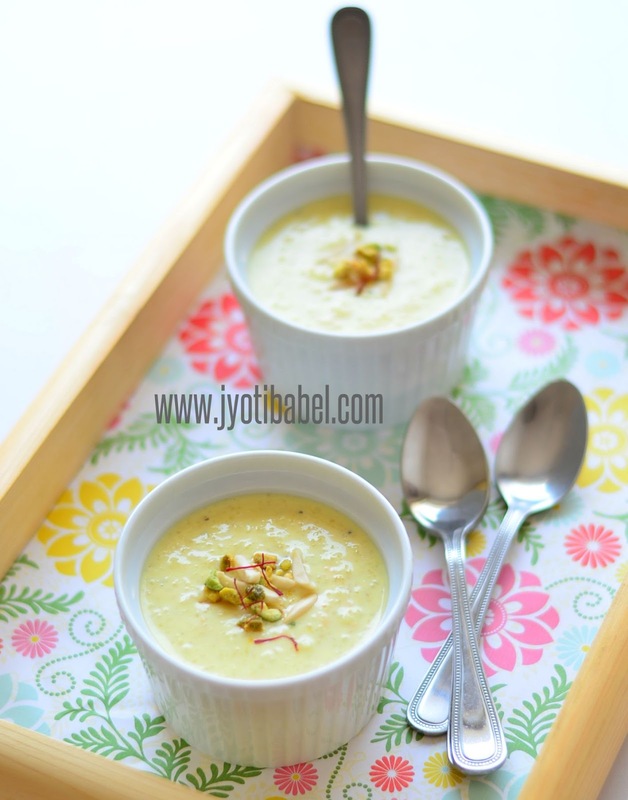 This kesar phirni looks so inviting with it looks. I have never tasted it, having saffron as a ingredient surely gives a lip smacking taste. Such a creamy and mouthwatering sweet! There are so many versions of milk based rice sweets in Indian cuisine with slight variations and each one tastes equally good. The kesar phirni looks very pretty with that pale yellow from saffron . Looks creamy and tempting as well ! Phirni is one of my fav dessert. The addition of saffron makes it so beautiful and flavourful. wow such an lovely presentation and phirni looks divine jyoti :) loved how you have achieved the creamy texture .. yummmmm..
Amazing pictures and the kesar in there makes it seem so exotic and divine. Wow the pictures are awesome..very lovely clicks! The phirni is so inviting and that color is amazing. Simply love it. Bookmarking it. Very delightful kesar phirni i have even seen, too tempting and ultimate it looks. I love phirni more than kheer and this kesar phirni is calling my name. Lovely clicks of a creamy and decadent looking dessert. Saffron has lent such a nice color to Phirni -- makes it look so inviting. wow looks inviting dear! so beautifully clicked! saffron has beautifully colored the phirni, looks rich and creamy! Such a creamy phirni....a classic dessert! I would so love some spoonfuls right away!